After getting my son’s report card from LSGH last April 8, we (me, hubby and son) headed straight to Makati Medical Center for my husband’s blood test. Because it was almost lunch time when his blood test was done, hubby suggested we have lunch at Floating Island Restaurant before going home. Who was I to decline such a nice offer? 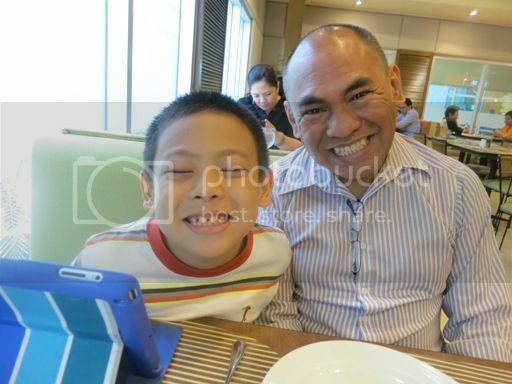 While waiting for our lunch to be served, father and son gamely posed for the camera. The photo above is one of their funny pictures. And then our food arrived: Adobo Rice and Assorted Vegetables with Quail Eggs, plus Pudding de Leche for dessert. 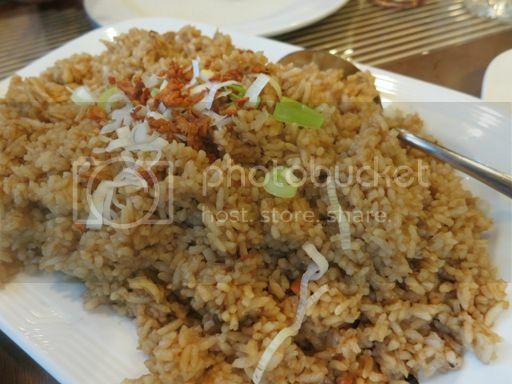 At first glance, this Adobo Rice looks ordinary, but it’s not. Also, the menu says it’s good for 2 persons only, but the serving is huge; it can actually be shared by 3 or 4 persons. 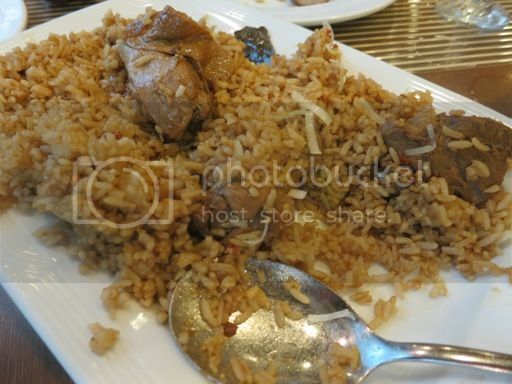 See what I mean when I said this is not ordinary Adobo Rice? Hidden beneath this Adobo Rice are several large pieces of tender and flavorful pork and chicken cooked adobo-style, of course! Because this Adobo Rice was delicious, we almost finished the entire platter! Lol! We will order this again. We ordered this because of the quail eggs, but we were disappointed to see only three quail eggs on the plate. Chayote, carrots and Baguio beans were sautéed in tomatoes, and quail eggs were added to make this vegetable dish. Surprisingly, our son enjoyed its sauce; he said it’s yummy! This is something we can easily prepare at home. 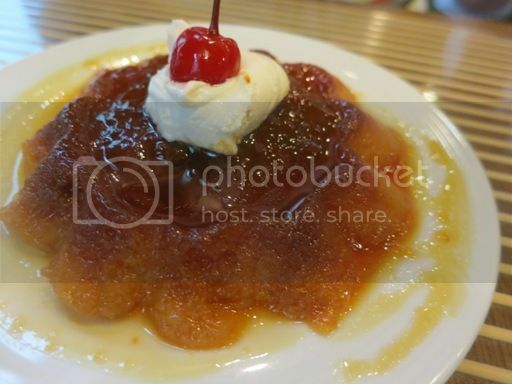 Another one of my son’s favorite food at Floating Island Restaurant is this Pudding de Leche. The pudding was topped with cream and cherry. I only had the cherry, while father and son shared the pudding. The little boy wanted to order one more pudding, but we were able to convince him that his tummy was already full. Lol! We don’t get tired of eating at Floating Island Restaurant because each time we visit, we always discover new and interesting dishes. 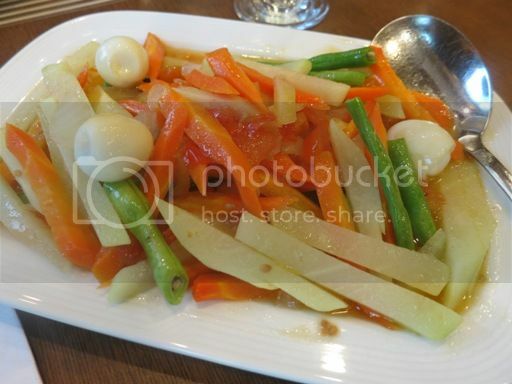 This entry was posted in Adobo Rice, Assorted Vegetables with Quail Eggs, Floating Island Restaurant, Makati Medical Center, Pudding de Leche. Bookmark the permalink. The adobo rice looked delish! I am working near Makati Med, however, I haven’t had the chance to visit the said resto. I hope they’re open during my shift. I haven’ tried thi resto yet but that pudding looks yummerz! Pudding De Leche’s got my curiosity piqued… is it like leche flan? ← Press Con and Taping of Bonakid Pre-School Ready Set Laban!